One of the most popular collector’s coins in the world is the Proof Gold American Eagle. Part of a larger program that consists of silver and platinum coins, as well, the Proof Gold American Eagle is the collector’s version of the official gold bullion coin of the United States. 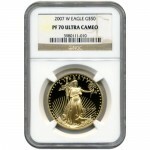 Today, Silver.com is proud to offer the 2008-W 1 oz Proof Gold American Eagle in perfect condition. Contains actual gold content of one troy ounce. Coins ship in PCGS protective slabs to ensure coin’s perfect condition. Proof coins originated as a means of testing the accuracy and quality of bullion coin striking. Before launching large-volume coin programs, mints would strike a few “proof” coins to check the quality of the die and accuracy of the coining press. 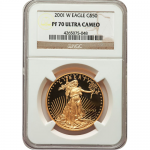 Today, proof coins such as the Proof Gold American Eagle are often more popular than their bullion counterparts because the rims are sharper and the design features more brilliant than other coins. On the obverse side is Augustus Saint-Gaudens’ depiction of Lady Liberty. Featured in full-length figure as she strides confidently into the future, a torch in her right hand as a guide, Liberty first appeared on the $20 Saint-Gaudens Gold Double Eagle between 1907 and 1933. The reverse side of each Proof Gold American Eagle features a family of nesting bald eagles. Designed by Miley Busiek, the image shows a male bald eagle flying over the family nest with an olive branch in its talons. Each coin in this listing has a perfect PR70 grade from the PCGS. PR70 coins have their full, original mint luster and no detracting flaws. Deep-cameo is a term used to describe coins with contrasting design sets and background fields, such that the former appears to float above the latter. Additionally, these coins from the United States Mint are unique in that they were the last struck prior to the 2009 halt in Proof Gold American Eagle production. Contact Silver.com with any questions you might have by calling us at 888-989-7223. We’re also conveniently available online using our live web chat and email services. If you are interested in similar products, be sure to check out our full selection of Gold Coins.